The USB/External Storage Tool of Linksys Smart Wi-Fi allows the user to easily manage an external storage device connected to it. An external storage device, also called a Network Attached Storage (NAS), lets you store and share content across your network. To know the supported file systems of your router, check the product specifications in the user guide. Click here to get a copy of the downloadable files for various Linksys products. IMPORTANT: External Storage is displayed as USB Storage among Linksys Smart Wi-Fi Routers with older firmware versions. This tool is not available on the Linksys EA2700 N600 Dual-Band Smart Wi-Fi Wireless Router. NOTE: For a video overview of the USB/External Storage Tool, click here. The Status tab displays information about your storage device. If you are using a previously configured hard drive, you will receive a message that a new USB or external storage feature is available. Click Continue in order to use the new USB features. This will not delete any data on the drive. This section only shows up when your external storage device is partitioned, dividing the hard drive into more manageable sections for quicker access. NOTE: The sample image below shows a partitioned Seagate Backup Plus Portable Drive 1 TB connected to a Linksys Smart Wi-Fi Router. For the Linksys Smart Wi-Fi Routers with dual USB ports, you can see multiple hard drives because of its capability of connecting two (2) external storage devices. NOTE: This image shows a partitioned Seagate Backup Plus Portable Drive 1 TB and a Western Digital My Passport 1 TB connected to a Linksys Smart Wi-Fi Router with dual USB ports. This section shows the name of the external storage device and how much space is currently being used. IMPORTANT: It is recommended to click on the Safely remove drive button first before disconnecting your storage device to avoid having any issues like losing or corrupting data. This section shows whether the folders and content in your storage device are accessible to others. If it is set to Off, the Secure Folder is disabled and anyone connected to your network can access all contents of your storage device. If it is set to On, the security is enabled and only specified users can see certain content. Folder access is set in the Folder Access tab. For instructions on how to do this, click here. This section shows the IP Addresses which are needed for users to access the storage device contents. For you to gain access to the contents, you will need to map your storage drive on your computer first. For step-by-step instructions on how to do this, click here. This section shows whether you have enabled or disabled access to your storage device using File Transfer Protocol (FTP). The FTP allows a user with Internet access to see the content of your storage device from a remote computer. 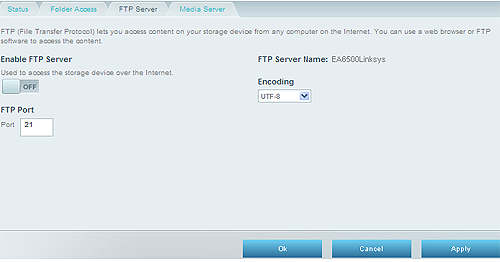 The FTP access is set up using the FTP Server tab. To learn how to set up this feature, click here. This section shows whether your router is configured as a media server, which lets you share media content across your network. Your router can act as a media server if you have UPnP Audio and Video (UPnP AV)-enabled or Digital Living Network Alliance® (DLNA)-certified devices connected to the USB port of your router. These devices include digital media players, gaming consoles or digital picture frames. The media server settings are in the Media Server tab. NOTE: This feature is not available in the Linksys EA3500 N750 Dual-Band Smart Wi-Fi Wireless Router. Folders in your storage device contain content, such as photos, videos and music. When using a USB storage device, you can decide which folders in the device can be seen and accessed by others. You can choose to have all content in the device accessible to everyone, or select specific content to be seen by specific users. For example, you may want vacation photos available only to specific members of your family but music can be available to anyone. If this option is turned OFF, all folders in the storage device are accessible to anyone who can connect to your router. If it is set to ON, folders in your storage device are accessible only to authorized users. Two (2) user accounts are preset for the router: Admin and Guest. The password for the Admin user is the router password. The password for the Guest user is guest. QUICK TIP: For step-by-step instructions on how to enable Secure Folder Access or create Authorized users, click here. You can access the folders in your storage device remotely as long as you have an active Internet connection using the FTP server. You can also access the content using a web browser or an FTP software. Turn this option ON if you want to enable the FTP server, which makes content available remotely. Turn this option OFF to disable the FTP server. This is the port used by the FTP server. Use the default port 21, or change to a different port. If you set up your router using the Linksys Smart Wi-Fi setup software, the FTP Server Name is prefilled with the name of your wireless network. This is the encoding (character set) for the transfer of files. You can use the default setting of Unicode (UTF-8), or change to something else. QUICK TIP: For step-by-step instructions on how to set up the FTP Server Tool on your Linksys Smart Wi-Fi Router, click here. 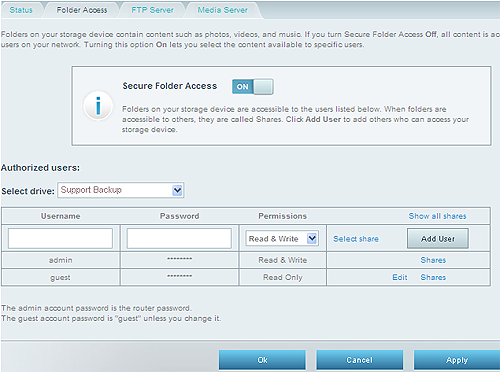 A Media Server lets you share content in your storage device across your network. Your router can act as a media server if it has a storage device attached and if you have a UPnP AV-enabled or DLNA-certified devices in your home. These include digital media players, gaming consoles with a built-in media player, and digital picture frames. You can specify which folders are used by the media server, add and delete folders, and specify how often the folders are scanned for new content. Turn this ON to enable the media server, or OFF to disable it. If you set up your router using the Setup software, the Server Name is prefilled with the name of your wireless network. Specify how often folders in the storage device are automatically scanned for new content. Scanning can take several hours, especially the first time the device is scanned, or if you add a lot of new content. Subsequent scans should take less time. To scan the folders immediately click Scan now. These are the folders that are shared in the media server. Add New Folder - To select a specific media folder in the drive, click Add New Folder and make your selection, then click Ok. NOTE: If there is no media folder to select yet, log in to the drive, create a folder and go back to the Media Server tab to select the newly created folder where you will be storing your media content. NOTE: Device List is displayed as the Network Map Tool in some Linksys Smart Wi-Fi Routers.